Make a difference in your community by donating today! You can make a donation through PayPal or by using a credit or debit card. 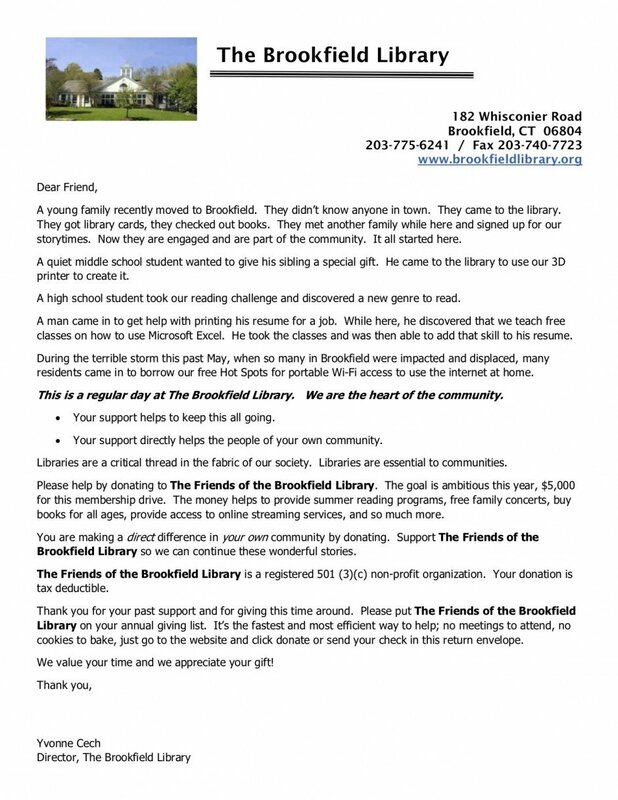 The Friends of The Brookfield Library was formed to give members of the community a way to personally support the library. It is a not-for-profit organization that raises funds intended to help develop the library’s resources beyond what is provided through the town budget. Your membership contribution will help the Friends to provide materials, equipment, and programs for the library so that it may better serve you and your family. The on-going book sale is housed on the main floor of the library, to the right of the entry doors. You’ll find mysteries, thrillers, romances, children’s books, teen books, DVDs, CDs, and more. Great selection at bargain prices! The Friends are seeking books in good condition to stock both its on-going and special sales. Donated books sell quickly due to bargain prices, so more are always needed. Do you need room for new books on your shelves? Are there books your children have outgrown? Please consider donating your gently-treated used books to the Library. Donations may be placed in the large tan bin to the right of the library’s main entrance. For more information about the Friends, please send an email to booksale.fobl@gmail.com. To join The Friends of The Brookfield Library, join online or print and submit an application form.